This delish Pizza is from Megan Pence, a talented and creative cook. Find more to drool over on her blog – Wanna Be A Country Cleaver . Over the last couple of years, I’ve realized something kinda profound…food bloggers are neurotic people. We are! We’ve got issues. We have to do it all, buy it, make it, shoot it, eat it, test it, edit it, post it and then clean up the entire simultaneous F-5 tornado and nuclear explosion that completely obliterated our kitchens. #Foodbloggerproblems We haz ‘em. This Supreme Pizza Pull Apart bread and I almost went round for round in the photography department last weekend, but I had to show it to you because I done ’bout ate half of it myself – it was that good, but I was raging the entire time because it was not nearly as kind to me to be photogenic for 10 minutes so I could take a half way decent picture. It was a stand off – there were tumble weeds blowing, Western shoot out music playing, twitchy gun slinger hands ready to take each other down in .149 flat. It was on! Ultimately, I won – with my face. But these photos do not do it justice for how good it is! Over the winter months so many food bloggers (including me) lamented the horrors and atrocities that are darkening winter nights, and rushed photo jobs. And JUST when we totally find out winter photo taking groove, Spring shows up with a smile and a “Hey, Girl…I got some sunshine for you” and then BLAMO, we have to get used to shooting all over again. No? Just my problem then? Okay, fair. Like I said – food bloggers are neurotic! We got 99 problems and lighting IS one. The same day as shooting this pizza bread I also had to make and shoot the Smoked Salmon Dip that I made for Julie’s Surprise Bridal Shower. The main difference between the two – this was shot in my dining room, where I usually shoot all my photos. The dip – shot in my bedroom. My bedroom. We follow the light and never did I think that in this cave of an apartment I’d be finding better light in my Bedroom. If I start shooting in my bathroom, that has no windows, one of you can give me an intervention and send me to sit in a corner. 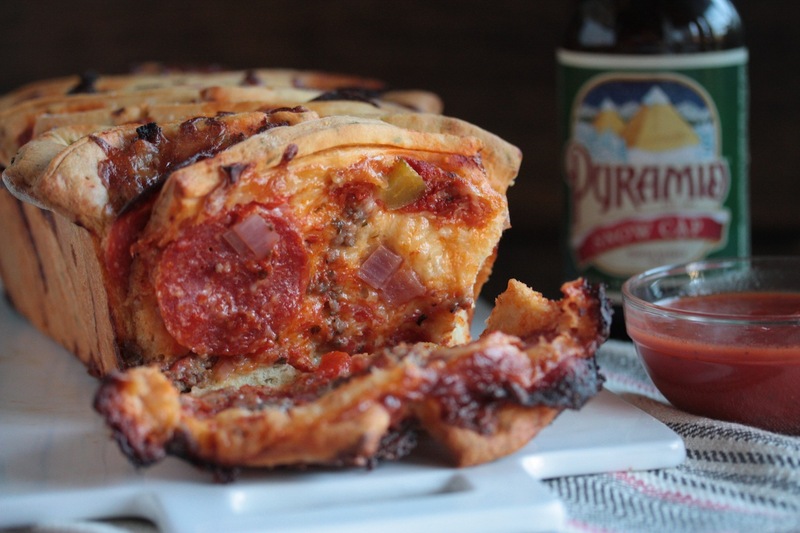 Rachel from Baked by Rachel has had me drooling over her pull Cinnamon Apple Pull Apart bread for months – MONTHS, so I had to borrow her recipe and make a pizza filled version that made me want to drink beer and watch football…. I greatly dislike and roll my eyes at football… THATS how awesome this is – I actually want to watch football. Next time this makes an appearance, I’m making her apple cinnamon version, and rewatching Downton Abbey. Again. In a stand mixer or large bowl, whisk together dry bread ingredients. In a medium bowl or measuring cup, whisk together wet ingredients. Attach the dough hook to the stand mixer. With the mixer on low, slowly pour the wet ingredients into the dry and mix the dough. Increase the speed to medium until dough pulls away from the sides of the mixer bowl and starts to form a soft ball. If the dough still sticks to the walls of the mixer bowl, add in small amounts of additional flour until the dough pulls completely away. Remove the dough from the mixer bowl and move to a lightly greased bowl. Cover with plastic wrap and place in a warm place to rise for about one hour. Lightly spray loaf pan with non-stick spray. Roll out the dough on a floured surface into a 12 x 20″ rectangle. Cut into 6 strips about 3″x12″ long. Spread pizza sauce on each strip, top with pepperoni, sausage, onions, peppers and mozzarella cheese. Cut each strip into thirds and stack each piece on top of the other. Repeat with other strips of dough. Place stacks one after another into the loaf pan. Let the dough rise in the pan for about 30 more minutes. Preheat oven to 350 degrees. Bake pull apart dough for 45 minutes. After 30 minutes, place remaining mozzarella cheese on top of the bread, cover the bread with aluminum foil gently and bake remaining 15 minutes. Remove from oven and let cool in pan for 15 minutes, then invert pan and serve. Serve with tomato sauce or pizza sauce for dipping. My mouth his watering just looking at the pictures. This looks fantastic! I know! But open and then shut on the yumness. I am trying to figure out how to stack this in the loaf pan (also size of pan? I was planning on using 9x4x4) , but picture looks like it’s stacked vertically but directions and size of dough rolled are for horizontal?? Help…I am trying to make this bread… Thanks! Nevermind I watched a couple videos and now see how I need to place filled dough in pan.. Thanks ANYWAY..Let’s hope it turns out good! Glad you figured it out! Did it turn out good? Megan Pence was the original maker! Thanks for stopping by. Come back and see us again!